The astrological belief that Mercury retrograde leads to confusion and breakdown is inherited from the time before we understood that Earth is not the center of the cosmos. From our perspective, Mercury appears to move quickly and erratically, so the ancients called it a messenger and a trickster. It took three millenniums to figure out that this was an illusion. Before that, Ptolemy constructed elaborate models in which the other planets spun around us like insane tops, and the models stayed with us long after the observations stopped matching the math. Copernicus’s heliocentric theory explained retrograde motion much more elegantly, but he kept it unpublished nearly until his death. Mercury told its story, anyway: To understand the illusion of its movement means to realize that we are not at the center of things, that there is a reality beyond the one we see. 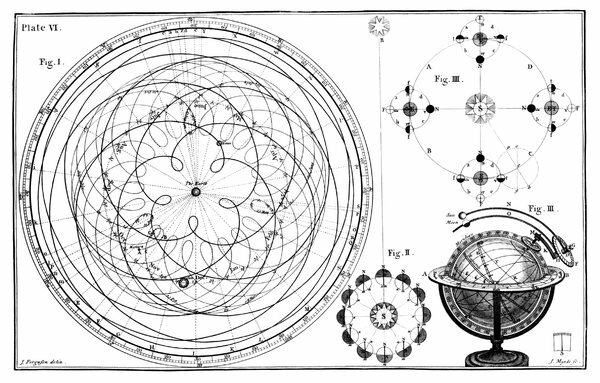 [image caption] Stuck in the Middle | A geocentric model of our universe, from James Ferguson’s 1756 “Astronomy Explained,” highlights its absurdity; the Ptolemaic system required that the planets in our solar system orbit Earth in strange, looping arcs. You will not find anything like that 1756 diagram in Ptolemy's Almagest, because his model never said anything about those strange looping arcs. He did not attempt to model the distance from the Earth. The Mercury retrograde motion is an illusion, but the same reasoning says that so is the rising and setting Sun, and the apparent motion of the stars in the night sky. Ptolemy's model was in use for well over a millennium, probably longer than any other scientific model of any kind. Yes, some data needed to be updated. I think that some of it was already out of date when Ptolemy was alive, as he did not have the latest astronomical data. But his model was pretty good. The short answer would be that it is possible to choose whatever coordinate system you like, including ones centered on the Earth, and then say “in that coordinate system the Sun goes around the Earth.” Hell, it’s possible to choose coordinate systems in which neither the Earth nor the Sun move at all! But some coordinate systems are better than others, and for understanding Solar System dynamics, an Earth-centered one is particularly dumb. If some Orthodox Jews want to argue that they have the right to be dumb, who am I to stop them? The Earth-centered coordinates may be dumb for understanding Solar System dynamics, but preferable for other purposes. So Carroll is wrong to say that they are dumb. Note, however, that while you can say “I am using a coordinate system where the Earth is at the center,” you can not say “Coordinate systems where the Sun [or the Solar System’s barycenter] is at the center are wrong.” So “geocentrism” is flatly incorrect. Also, not to belabor the obvious: early geocentrists were not relying on coordinate invariance, and attempts by modern ones to save the old ideas are kind of pitiful. I guess he is trying to say that Ptolemy got the right answer for the wrong reason, and so he should not get any credit. Ptolemy did not show how to convert from one coordinate system to another, or show the equivalence of coordinate systems. I do not know who first did those things. But regardless, there is nothing wrong with choosing a coordinate system and sticking to it. Maybe it is not as good for understanding dynamics, but it might be better for mapping the night sky. This US NSFA 2012 study measured public understanding of science by asking 10 questions. Whoever made this list does not understand that motion is relative. General relativity teaches that "Earth go around the Sun" and "Sun go around the Earth" are both correct. I would also re-phrase "The universe began with a huge explosion." We know that the universe is expanding, and that our best model has a big bang at a finite time in the past. But it is possible to believe that the universe existed in some other form before the big bang, so that it might not have started with an explosion. A quiz like this should be based on facts we know for sure. The two questions you criticise in the NSF 2012 study are both examples of the authors simplifying an issue for a non-technical audience to such an extent that the question is no longer meaningful. Their fundamental error is to choose questions where the real answer is too complex to allow for the necessary simplification. They also fail to consider whether it actually matters if the average citizen is aware of these things. The question about antibiotics is relevant to individual health and public policy, so it is something that most people ought to know. The question of whether the Earth orbits the Sun or the Sun orbits the Earth is entirely irrelevant to the lives of most people and to all major social and political issues. It isn't something that an informed and conscientious citizen needs to care about at all. The question about the "Big Bang" assumes that the origin of the universe is something that can only be explained in scientific terms, and that this is the sole and uncontested scientific description of how it happened. Therefore it cannot provide an accurate measure of public knowledge unless the possible answers include "understand the concept but reject it on religious grounds" and "understand the concept but favour other interpretations of the evidence". You've also made a minor error in referring to it as an "NSA" study rather than "NSF". However, it could be argued that the former agency would actually know more about the current state of American public opinion on just about every topic, so an NSA study might be more useful.